If you have an interest in Islamic poetry and music you might enjoy this free multimedia presentation at the Seattle Asian Art Museum, on Sunday April 21st from 2-4 pm. A talk will be given on sacred poetry and music in Muslim cultures by Dr. Nargis Virani, who is an author and professor of Arab and Islamic studies at The New School for Social Research in New York City. Dr. Virani’s talk will include the film Sufi Soul-Mystic Music of Islam, and will feature examples of mystical poetry in performance from Arabic, Persian, Urdu, Indonesian, Western European, and North American Muslim mystical traditions. boxoffice@seattleartmuseum.org with your name and number of people attending. Twelve of us recently gathered for the June SOI-Seattle Council meeting at Naquiba’s house for a colorful, flavorful pot-luck breakfast that nourished us at multiple levels. We then joined together to dream about the future of our local SOI community. Read on for how you can contribute. As a springboard for our discussion, we used an exercise suggested by the consultants who have been helping our Board function more effectively this past year. 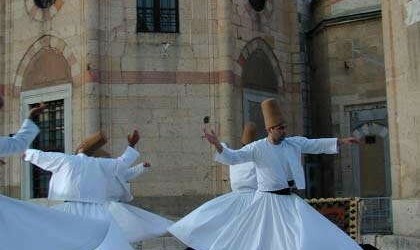 The simple exercise invited us each to imagine what three wishes we have for the health, vibrancy and well-being of our Sufi community, and we were encouraged to not let practical or logical factors limit our yearnings. We then paired up with another person and shared our wishes, and each pair then shared their top two wishes with the whole group. Numerous people shared similar wishes, such as creating more ways for individuals to meet and connect with each other in both structured and unstructured contexts. Other popular wishes were to attract more young people to our community, and to have a sustainable physical space for our Center. Many wishes involved creating and fostering more ways for us to support our individual and collective development, and to offer a wider variety of activities to serve our own needs as well as the needs of the Seattle and world communities. You can see the wish list so far at: Wish List SOI-Seattle Council Meeting June 2012. Council meeting minutes are available for viewing at: SOI-Seattle Council minutes 6-24-12. We hope more people in our community will participate in this dreaming process. Some of our teachers will be sharing the exercise in their classes this summer. You can add your wishes to the list by commenting or emailing me. We will be collating these wishes and drawing on them in planning for our community’s future. We welcome you to attend our next Council meeting September 15, where we will be taking the next step in making our wishes come true.